This story introduced G-8’s foe Dr Todini. 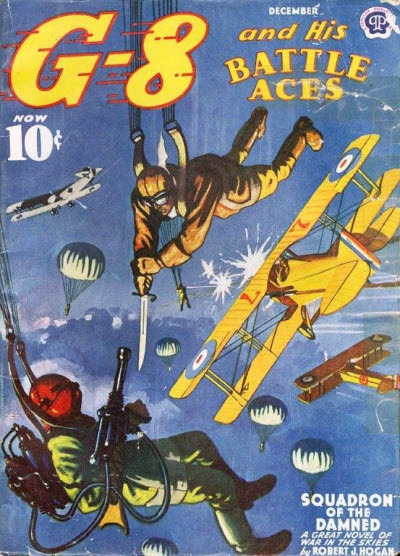 Balladeer’s Blog resumes its look at the neglected Pulp Hero G-8. This is a story-by- story look at the adventures of this World War One American fighter pilot who – along with his two wingmen the Battle Aces – took on various super-natural and super- scientific menaces thrown at the Allied Powers by the Central Powers of Germany, Austria- Hungary and the Ottoman Muslim Turks. G-8 was created by Robert J Hogan in 1933 when World War One was still being called simply the World War or the Great War. 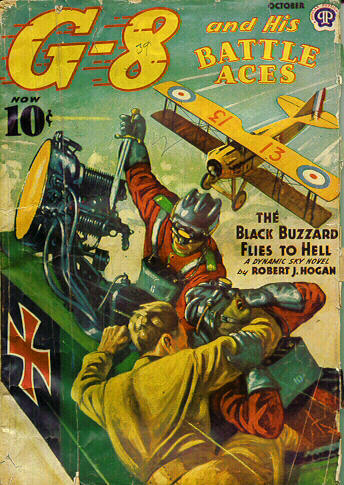 Over the next eleven years Hogan wrote 110 stories featuring the adventures of G-8, the street-smart pug Nippy Weston and the brawny giant Bull Martin, his two Battle Aces. 85. 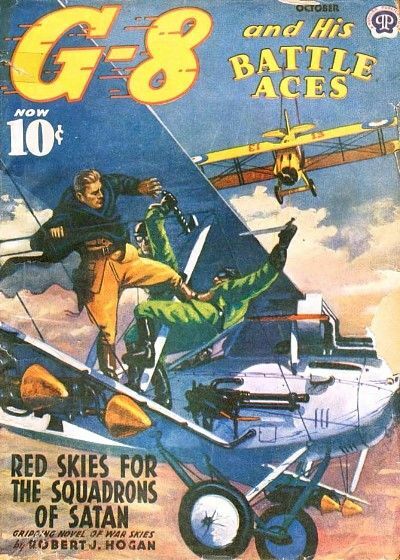 RED SKIES FOR THE SQUADRONS OF SATAN (October 1940) – G-8’s foe Firehammer is back! It turns out the villain survived his previous encounter with our heroes and, once again operating out of his base on the Moselle River, has constructed a new and improved version of his lightning machine. Firehammer’s lightning machines have no connection to the lightning cannons and handguns created by the German Dr Geinor in The Damned Will Fly Again, but you’d think Robert J Hogan would have just used Firehammer again in that story since Geinor was pretty unmemorable. 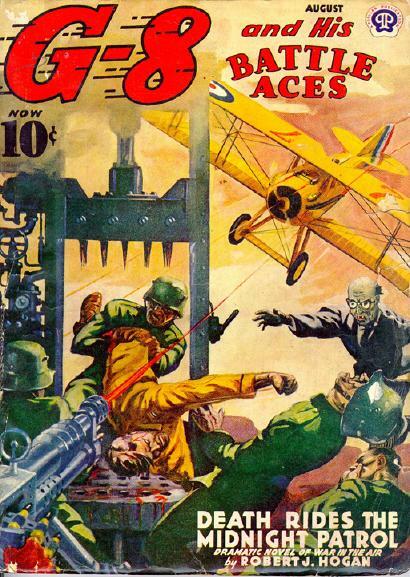 Balladeer’s Blog resumes its look at the neglected Pulp Hero G-8. This is a story-by- story look at the adventures of this World War One American fighter pilot who – along with his two wingmen the Battle Aces – took on various super- natural and super- scientific menaces thrown at the Allied Powers by the Central Powers of Germany, Austria- Hungary and the Ottoman Muslim Turks. 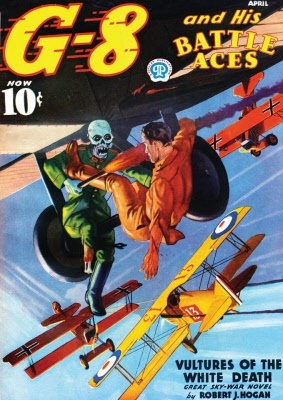 G-8 was created by Robert J Hogan in 1933 when World War One was still being called simply the World War or the Great War. Over the next eleven years Hogan wrote 110 stories featuring the adventures of G-8, the street-smart pug Nippy Weston and the brawny giant Bull Martin. The regular cast was rounded out by our hero’s archenemy Doktor Krueger, by Battle, G-8’s British manservant and by our hero’s girlfriend R-1: an American spy/ nurse whose real name, like G-8’s was never revealed. 82. 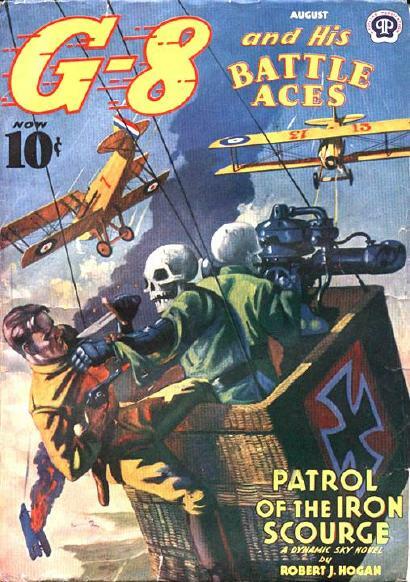 THE DAMNED WILL FLY AGAIN (July 1940) – Grun (“Groon”) the Primeval strikes again! To nobody’s surprise Grun survived his apparent death at the end of his previous appearance. The green-skinned mutant is still pretending to work with the Central Powers while secretly furthering his plans to eliminate all “normal” people on Earth, allowing him and his fellow mutants to take over the world. G-8’s foe Grun the Primeval debuts in this week’s trio of tales. 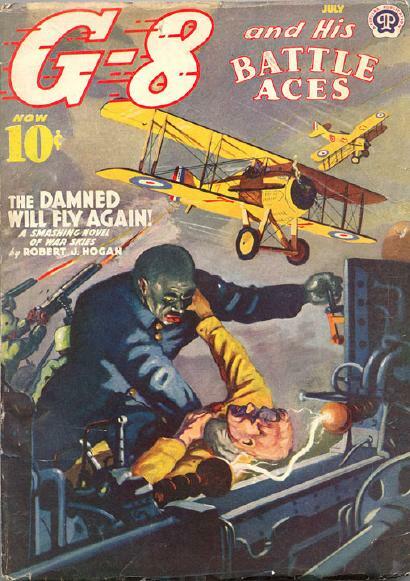 Balladeer’s Blog re-sumes its look at the neglected Pulp Hero G-8. This is a story-by- story look at the adventures of this World War One American fighter pilot who – along with his two wingmen the Battle Aces – took on various super- natural and super- scientific menaces thrown at the Allied Powers by the Central Powers of Germany, Austria- Hungary and the Ottoman Muslim Turks. 79. WINGS OF THE DRAGON LORD (April 1940) – The Chinese genius Chu Lung strikes again! In real life China entered World War One in August of 1917 but the nation’s internal turmoil prevented it from having much of an impact on the war. Chu Lung, a variation of Fu Manchu and Wu Fang, picked up the slack for his country, at least in Robert J Hogan’s G-8 stories. The aristocratic scientist has discovered literal dragon creatures living in China’s Gobi Desert and seeks to harness them for the nation’s war effort. He’s not just going to waste them in frontal assaults on the Allied armies, though – his plans are much more sinister and far-reaching. 76. 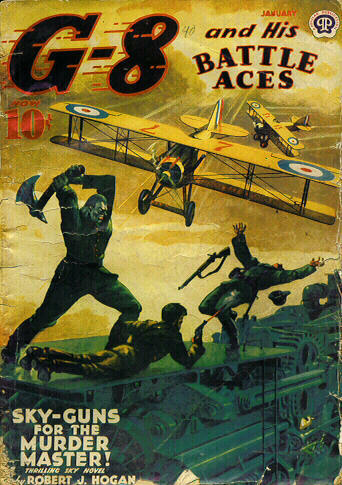 SKY-GUNS FOR THE MURDER MASTER (January 1940) – Introducing an all-new foe for G-8 – Count Maulwurf! The Count is fondly regarded by World War One geeks like me because he was clearly based on the real life Paul von Lettow-Vorbeck, “the Rommel of World War One”. Lettow- Vorbeck was sort of a “Jungle Fox” to Rommel’s Desert Fox. He was the most effective German General in Africa during the First World War and was still on the loose when the surrender was signed on November 11th, 1918. 73. THE BLACK BUZZARD FLIES TO HELL (October 1939) – Introducing a new member of G-8’s Rogue’s Gallery of foes – Nordlich the Inventor! Herr Nordlich has put his genius to work and has come up with stealth planes coated in a special coal-black paint and capable of carrying over twice the bomb payload of other planes. In addition he’s invented special helmets that permit the planes’ pilots to see each other AND see in the dark of night. 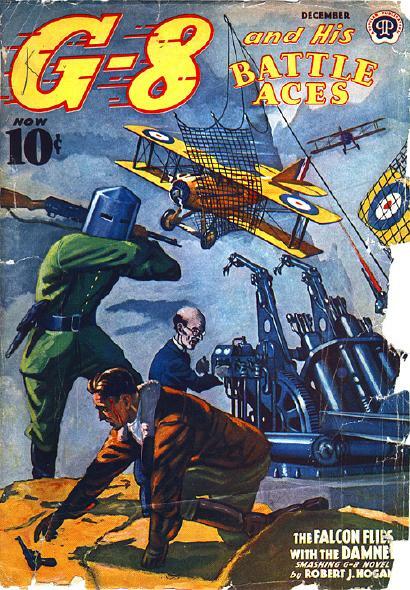 Balladeer’s Blog resumes its examination of the neglected Pulp Hero G-8. 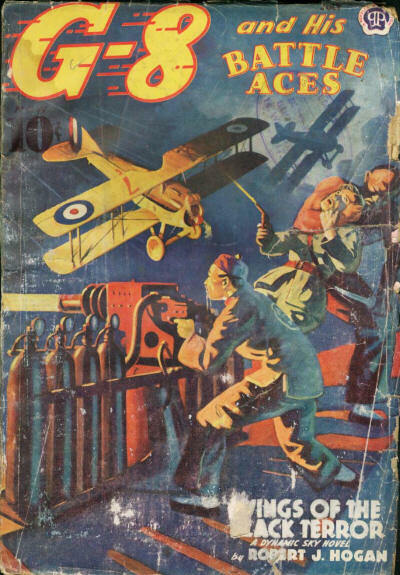 This is a story-by- story look at the adventures of this World War One American fighter pilot who – along with his two wingmen the Battle Aces – took on various supernatural and super- scientific menaces thrown at the Allied Powers by the Central Powers of Germany, Austria- Hungary and the Ottoman Muslim Turks. 70. 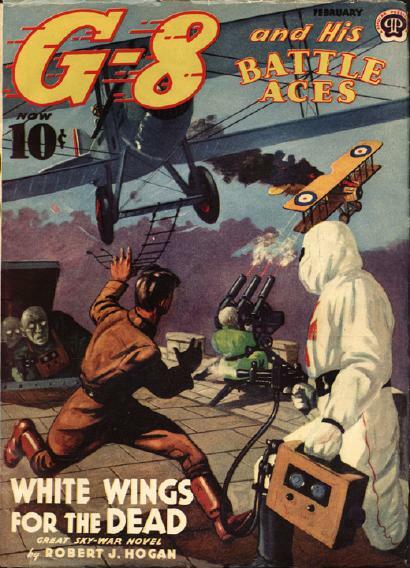 WINGS OF THE BLACK TERROR (July 1939) – The Chinese genius Chu Lung is back for another go-round with G-8! 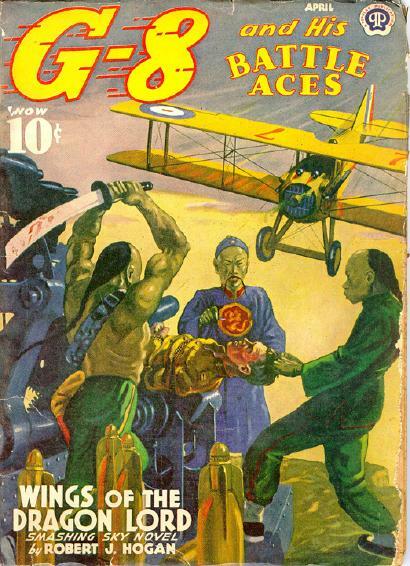 As always I consider Chu Lung to be just a pale imitation of Fu Manchu or Robert J Hogan’s own Wu Fang, the star of one of the short-lived Villain Pulps.